Apparently we have a pretty good selection of forks. Choose from the new Marzocchi 2014 range, the new Marzocchi 44 micro switch TA now in stock cost around £600. Air mountain bike suspension forks for everything from XC racing to flying at the bike park—super-light and durable with travel ranging from 100mm to 180mm. Travel adjustable, air mountain bike suspension forks that are perfect for trail riding and shuttle-less freeriding. Travel adjustability is 2-position, ranging from 140/110mm to 180/140mm. Super-plush, coil mountain bike suspension forks for all-mountain, freeride, and the bike park—light weight and bulletproof. 4X, dirt jump, and pump track slaying air mountain bike suspension fork—built to take the big hit with a travel range of 100mm to 120mm. The legendary dual-crown, downhill mountain bike suspension fork with 8 inches of travel delivered through its confidence-inspiring 40mm upper tubes. The Earth is Not Flat. 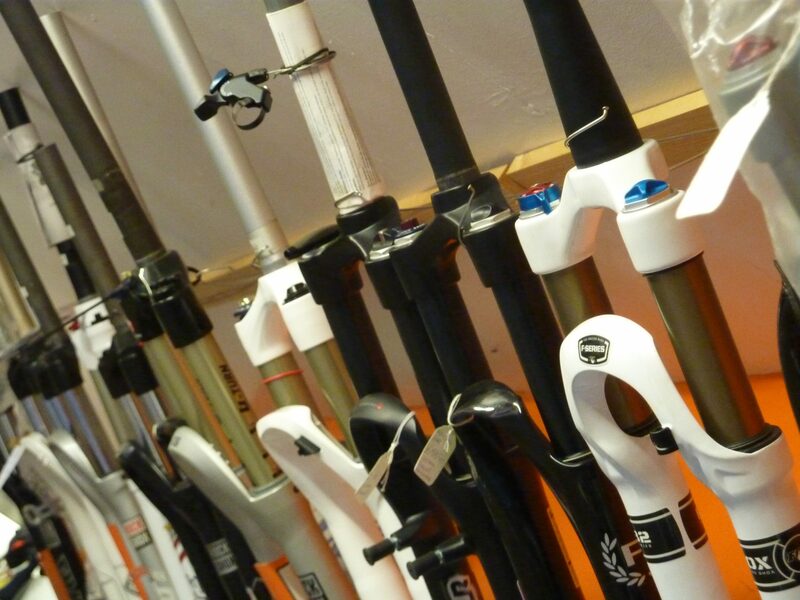 RockShox produce the best suspension available, ridden by the worlds best riders. Whether your discipline is in cross country, downhill, 4X, freeride, all mountain, or even dirt jump, RockShox have the suspension platform for you. Offering market leading damping technologies such as Mission Control & Motion Control, ‘on-the-fly’ U Turn & 2-Step instant travel adjustment systems, not to mention numerous ‘BlackBox’ technologies developed directly from the race circuit, RockShox continue to lead the way in all things suspension!